Accepted for publication 16 January 2004. Published 2 March 2004. Muhammad Ali Khanzada, Abdul Mubeen Lodhi, and Saleem Shahzad, Pest and Disease Research Lab, Department of Botany, University of Karachi, Karachi-75270, Pakistan. Khanzada, M. A., Lodhi, A. M., and Shahzad, S. 2004. Mango dieback and gummosis in Sindh, Pakistan caused by Lasiodiplodia theobromae. Online. Plant Health Progress doi:10.1094/PHP-2004-0302-01-DG. Pathogen: Lasiodiplodia theobromae (Pat.) Griffon & Maubl. Synonyms: Botryodiplodia theobromae Pat. ; Diplodia theobromae (Pat.) Nowell; Lasiodiplodia tubericola Ell. & Ev. ; Diplodia tubericola (Ell. & Ev.) Taubenh; Botryodiplodia tubericola (Ell. & Ev.) Petrak. Teleomorph: Botryosphaeria rhodina (Berk. & Curt. ); synonym: Physalospora rhodina Berk. & Curt. The fungus is commonly known as Botryodiplodia theobromae (Pat.). However, Sutton (5) has adopted the name Lasiodiplodia theobromae Griff. & Maubl. as suggested by Zambettakis (6). L. theobromae has also been recognized by Hawksworth et al. (4), and B. theobromae is now, therefore, considered to be a synonym of L. theobromae. The current Latin binomial for the fungus can be obtained online from the CABI Bioscience Databases (2). Dieback. In affected plants, twigs die from the tips back into old wood, giving a scorched appearance to the limb (Fig. 1). The young green twigs start withering first at the base and then extending outwards along the veins of leaf edges. The affected leaf turns brown and its margins roll upwards. Leaves scorch and fall, leaving a dead branch. In severe conditions, branches start drying one after another in a sequence (Fig. 2) resulting in death of the whole tree (Fig. 3). Fig. 1. Dieback of branches on a mango tree. Fig. 2. A mango plant showing sequential death of branches. Fig. 3. Death of mango tree caused by dieback disease. Gummosis. 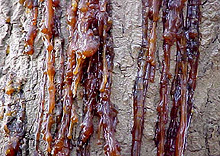 The infected plants show abundant gum secretion from branches, stem, and main trunk. 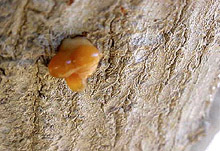 Initially the gum appears as a small droplet (Fig. 4). However, as the disease progresses, it increases and covers most of the branch (Fig. 5) and trunk (Fig. 6). Under severe conditions, the outer wood of a branch cracks and splits (Fig. 7) and exudes a yellow to brown, gum-like substance (Fig. 8). Fig. 4. A small droplet of gum exuded by a branch of a mango tree. Fig. 5. Heavy gummosis on branches of a mango tree. Fig. 6. Heavy gummosis on main trunk of a mango tree. Fig. 7. A branch of a mango tree showing splitting of bark. Fig. 8. Gum oozing-out from the split bark. Browning of vascular tissues. In infected plants, the twigs and branches show internal discoloration. 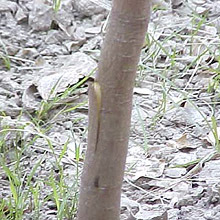 Brown streaks in vascular regions are visible upon splitting the twigs lengthwise (Fig. 9). Fig. 9. Browning of vascular tissues. The disease may occur any time throughout the year in Pakistan. Plants growing under water stress conditions show more severe symptoms compared to regularly watered plants, indicating that water stress apparently predisposes the plant and enhances the severity of disease. This fungus has a wide host range. It attacks more than 280 species of plants in different parts of the world (3,5). In Pakistan, the fungus has been reported on more than 50 plant species (1). The fungus is a common soil-borne saprophyte or wound parasite, distributed throughout the tropics and subtropics (3). Root and stem samples were cut into 1-to-2-cm pieces, surface sterilized with 5% sodium hypochlorite solution for 2 min and placed in sterilized Petri plates containing either potato sucrose agar (PSA) or two layers of moistened blotter paper and incubated at 30°C with 12-h alternating periods of light and darkness. Specimens were examined after 1 week for fungal growth. 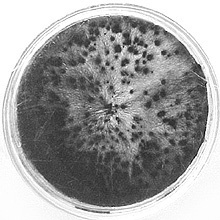 On PSA, colonies were initially white, soon becoming black and fast-spreading with immersed and superficial, branched, septate mycelium. Shiny black pycnidia were produced on the surface (Fig. 10). Fig. 10. Colony of Lasiodiplodia theobromae showing pycnidia. Conidia were initially hyaline, unicellular, subovoid to ellipsoidal, with a granular content (Fig. 11). 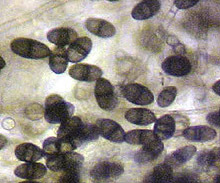 Mature conidia were two-celled, cinnamon to dark brown, thick walled, ellipsoidal, often with longitudinal striations 18 to 30 × 10 to 15 µm in size (Fig. 12). Fig. 11. Immature, hyaline, unicellular conidia of Lasiodiplodia theobromae. Fig. 12. 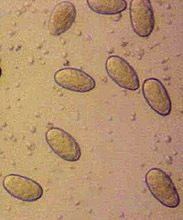 Mature, dark brown, bi-celled, thick walled conidia of Lasiodiplodia theobromae. The morphological characters for pycnidia and conidia were similar to those given by Sutton (5). The pathogen was maintained on PSA slants at room temperature and in a refrigerator for several months. Cultures were also maintained on wheat meal-soil medium. Wheat meal was mixed in sandy-loam soil at 5% w/w and 10 ml distilled water was used to moisten 100 g medium. The mixture was transferred in 250-ml flasks at 100 g per flask and sterilized at 15 p.s.i. for 20 min. A 1-cm2 block of agar containing mycelium of L. theobromae was added in each flask and the flasks were incubated at room temperature for 2 wk with frequent shaking. Storage for an extended period was accomplished by inoculating the fungus on chopped, moist sterilized wheat straw in 250-ml conical flasks. The flasks were incubated at room temperature. Pathogenicity tests were carried out at farmers’ fields and in the screen house of the Pest & Disease Research Lab (PDRL). A famous and widely cultivated variety Langra was used in these experiments. In farmers’ fields, 3 to 4 years old, apparently healthy plants were selected. Specimens were taken from branches and roots, cut into 1-cm-long fragments, surface sterilized with 5% sodium hypochlorite solution, and placed on the surface of PSA medium to confirm the absence of the pathogen. Plants found infected with the test pathogen were not used in the study. Roots and stems of separate plants were inoculated by making a cut in the stem (Fig. 13) or root (Fig. 14) using a sterilized knife. A 1-×-2-cm inoculum block from 5-days-old culture on PSA was placed in the gap and the inoculated portion was wrapped with Para film. A 1-×-2-cm PSA block without fungus was placed in control plants. Plants were irrigated after inoculation and the wrapping material was removed from the stems after 2 wk of inoculation. Plants were monitored for the development of disease symptoms and the pathogen was re-isolated from roots, stem, and branches of the test plants to confirm the pathogenicity. The experiment was conducted at 3 different orchards. In each experiment, four different sites in an orchard were used and the experiment was laid down in a randomized complete block design. Fig. 13. A cut made in stem of a mango tree for inoculation with Lasiodiplodia theobromae. Fig. 14. Bark removed from root of a mango tree for inoculation with Lasiodiplodia theobromae. After one month of inoculation, plants inoculated with L. theobromae showed typical symptoms of the disease as observed during the survey. Symptoms included wilting and death of leaves at the tip (Fig. 15), gum exudation (Fig. 16), and internal browning of the vascular tissues (Fig. 17). Control plants did not exhibit the typical symptoms and remained normal and healthy. It clearly indicated that the decline and gummosis is caused by L. theobromae. It was interesting to note that the symptoms appeared early and more prominently in stem inoculated plants as compared to root inoculated plants. Re-isolation from the dead and green branches of L. theobromae-inoculated plants showed up to 95% recovery. Fig. 15. Wilting and death of leaves in apical region of an inoculated plant. Fig. 16. Exudation of gum from an inoculated plant. Fig. 17. Browning of vascular tissues in stem of an inoculated plant. In the screen house experiment, seeds obtained from an apparently healthy tree of variety Langra were surface-sterilized with 5% sodium hypochlorite solution and sown in sterilized sandy-loam soil kept in 8-cm diameter plastic pots. After 2 months of germination, roots and shoots of the plants were inoculated with the pathogen using the method described above. The inoculated plants showed defoliation and necrosis of the shoot tip. Gradually, all the plants were killed. Shoot inoculated plants died earlier as compared to the root inoculated plants. 1. Ahmed, S., Iqbal, S. H., and Khalid, A. N. 1997. Fungi of Pakistan. Sultan Ahmed Mycolog. Soc. Pakistan, Dept. Bot., Univ. Punjab, Lahore, Pakistan. 2. CABI Bioscience. 2003. IndexFungorum: The CABI Bioscience and CBS Database of Fungal Names. Online. 3. Domsch, K. H., Gams, W., and Anderson, T. H. 1980. Compendium of Soil Fungi. Vol.1. Academic Press, NY. 4. Hawksworth, D. L., Kirk, P. M., Sutton, B. C., and Pegler, D. N. 1995. Ainsworth & Bisby’s Dictionary of the fungi. Eighth edition. CAB Int., Wallingford, Oxan OX10 8DE, UK. 5. Sutton, B. C. 1980. The Coelomycetes. Commonw. Mycolog.l Inst., Kew, Surrey, England. 6. Zambettakis, E. C.1954. Recherches sur la systematique des “Sphaeropsidales-Phaeodidymae”. Bull. Trimest. Soc. Mycol. Fr. 70:219-349.